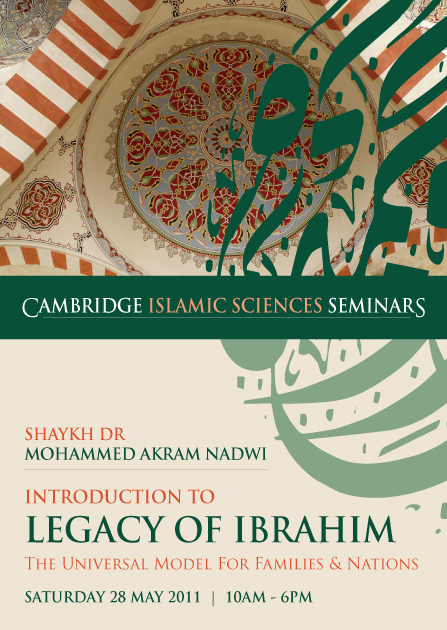 Cambridge Islamic Sciences: Secrets of Islamic Spirituality - Unveiled! Islamic Spirituality or what is commonly known as Tasawwuf is sometimes a very complicated subject for many people to grasp and understand especially when it is enshrouded with deep philosophical concepts and examples of strange mystical experiences of people. However at the same time spirituality is at the root of the religion because any outward action devoid of spirit (or inner state) is of no real significance or value. Thus Islamic Spirituality is of utmost importance to every Muslim. But is there a more definite and straightforward way of understanding and practising it? Fortunately there is, in the story of Prophet Ibrahim (AS) in the Qur'an. The life of Ibrahim (AS) is filled with spiritual awakenings which he experiences in his childhood, youth, maturity and old age. Apart from being a Messenger of God, he attained the high station (maqaam) of being the Khalilullah or the intimate friend of Allah. The Qur'an tells us that he is a prime example of one who perfected the outer (dhahir - physical) as well as the inner (bathin - spiritual) dimensions of life in perfect 'uboodhiyyah (slavery) to Allah. As such our Prophet Muhammad and the rest of the Muslims are commanded by Allah in the Qur'an to follow the philosophy (millah) and example of Ibrahim (Qur'an 3:95, 60:4). So what are the secrets of Ibrahim (AS) in achieving these levels of spirituality at different stages of his life? How did he achieve the highest state of Ihsan (spiritual excellence)? What was his philosophy? What was his practice? In other words what is "Ibrahim's way of Tasawwuf"? This is your opportunity to explore these and many other important issues in this amazing first-of-its-kind seminar by Shaykh Dr Mohammed Akram Nadwi titled Legacy of Ibrahim - The Universal Model for Individuals, Families and Nations on Saturday 28th May 2011. Register today to help you in your journey to reach the state of Ihsan and be one of the Awliya (friends) of Allah like Ibrahim (AS).